Open up your living space with a picture window, allowing light and views of the outdoors into your home. Picture windows are fixed windows that do not open. They are usually installed in difficult to reach places to let in light. For unobstructed views where ventilation is not a concern, picture windows are ideal. Picture windows create a portrait-like space on walls - hence the word "picture" in their name. Picture windows are also a popular choice for letting in natural light without cold air in areas of a room that may be most susceptible to drafts. In picture windows, insulated glass is a great option for added performance and increased comfort in the home. 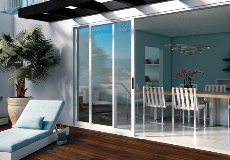 Insulated glass is a combination of two or more panes of glass with a hermetically sealed air space between them. Optional inert gases like argon or krypton may be used between panes to further improve thermal performance and energy savings. Picture windows are available in these Milgard product series. A contemporary vinyl window with an expansive viewable glass area and a narrow frame. Satisfy your desire for a clean design with Style Line® Series slim-profile windows.